So I'm thinking of adding autopilot to my 265 Express. It has manual Seastar 1.7cu in Tilt helm. I would need to add power assist pump which I'm seeing as $1800...can that be right? For autopilot I see I would also need an autopilot pump at $400. I'm guessing I could get the electronics without the pump but it would probably cost me more! so I'm looking at $4000 to upgrade? Holy ship! I need a beer. I need to sell this beast and dust off the canoe. You don't have to install power steering to install autopilot. If you are happy with the way your boat steers manually now, just install a normal autopilot with a standard AP pump. Skunkboat, by manual 1.7cu helm I take it that you have hydraulic steering ? Thanks guys. I did not realize that you can use an autopilot pump without also having power assist. You know, Seastar website isn't very clear on this subject. I did finally see one illustration with only an autopilot pump byut they don't explain it all. They also don't explain which Autopilot Controllers to use or how they connect to the Seastar AP pump....is it a standard? or does everyone have different plugs and pin outs? So, assuming I don't want power assist, I can buy whatever brand of autopilot "kit" and they are all in the $1500 to $2500 range, depending on brand and bells and whistles. I have twin 225s with a single seastar cylinder and a crossbar. I have Garmin electronics. Skunk, The instructions with the autopilot will explain all the connections you need to make. As far as which controller to use, it will depend on which course computer you choose. Usually there will be more than one controller that is compatible with any given course computer. Just make sure that the controller you choose has the ability to let you change course using the controller itself without needing to use the MFD screen. That is my feelings anyway. My particular controller has two sets of buttons for course change. One set changes course one degree for each click and the other set changes the course 10 degrees for each click. The one I had before had a rotary knob that took care of those duties. Every brand has their own idea. If you spring for the shadow drive then that is all mute because you just take the helm away from the computer by simply turning the wheel. I'm not a huge fan but have only ran my friends boat that has it and have never owned that system myself. My buddy has had a bit of trouble with it but that one case means nothing. The controller doesn't connect to the pump. It connects to the course computer. The course computer is connected to the pump by two wires Positive and negative 12v. The course computer keeps track of the boats heading, course over ground, pitch, roll and yaw, then it compares all that over time how it compares with the course that you have ask it to keep. 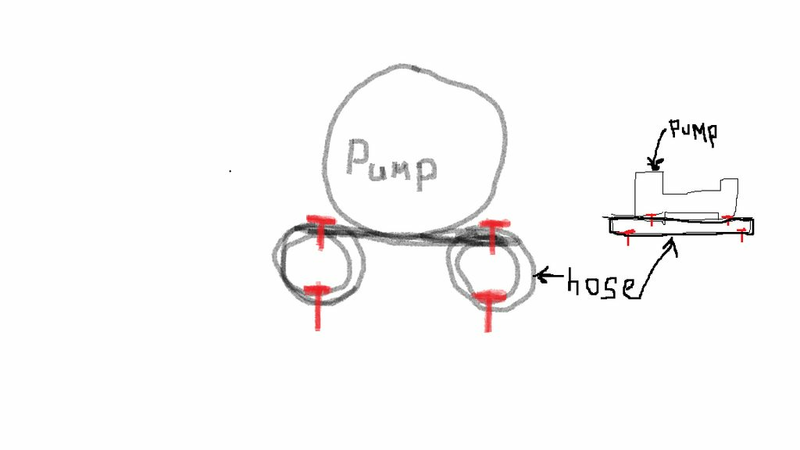 It then runs that pump forward or backward by reversing the polarity of those two wires so the fluid will be alternating its direction as needed to keep your engines pointed in the necessary direction to satisfy the course requirements. I would recommend that you pick a kit that includes a good quality pump of the correct displacement for your hyd. system (that's where the Seastar charts come in handy). Some of the cheaper pumps are noisy and they are a very busy piece of equipment so quiet is good. Also do some research to make sure the autopilot you choose will hold heading at idle speed troll. That way you can leave the helm to take care of rigging duties and such with the AP holding course and your trolling spread stays nice and tight. My particular setup will hold course at 1 1/2- 2 knots steadily. I have an older system and it includes a rudder indicator and a fluxgate compass. From what I understand some of the newer electronics do away with those separate items...just make sure, if you use this AP for fishing that it works at slow troll speed. Good luck. Have fun....it's the best add-on there is. I’ve just installed a new Lowrance unit in my Marlin, “Lowrance autopilot with twin outboards” thread on here recently, it works a treat. The flux gate is replaced with the point 1 electronic version nowadays. The Lowrance unit took me through the commissioning which made it all incredibly easy. Skunk, Garmin has the smartPump AP with GHC20, the CCU and pump for around 3K if you shop for the old non V2 pump. Garmin's number for that is 010-00705-69. It'll save you around a grand since Garmin dropped the pricing restrictions on it in lieu of the newer pump. As soon as it quits snowing and sleeting, that's what's going in my boat. Thanks for the tip on mygreenoutdoors price it was $3029 when I looked but found it for $3011.50 on HodgesMarine.com. Then I went to West marine and got price match. So I get WM points and I bought their protection plan for $200 which lets me deal with WM instead of Garmin if there is a problem. Normally I don't like protection plans but their plans extend the "just bring it back and get another one" time. I won't even be in the water within the normal 30 days. That's great news SkunkBoat! That's gonna be fun to install and the best payoff as far as user satisfaction. It makes those long 2-3 hr runs far less tiring when you don't have to continually be dealing with quartering seas forcing you off course and having to watch the compass and chart continually. The ability to look in the cooler for a be....a beverage without screwing up your spread is worth a million. When you get that big grin under control, come back and tell us why you waited so long. Anyone with an autopilot on a 265? Where is your pump mounted? I had a Simrad AP on my 265. The display was mounted between the upper electronic boxes. The pump, rate compass and computer were all installed behind the drawers in the cabin. This space is also accessible from the deck plate in front of the helm seat, however I found easier access through the cabin. I eventually had a problem with the computer which was replaced. The replacement unit I mounted in the back of lower electronic box. The AP was a great feature, I used it all the time. I was thinking that would be a good place for the pump. Thanks for confirming. Looks like Its going to be close. Its tough to tell from your picture, but the your pump appears to be larger then my simrad. The other option would be under the sink and behind the cockpit drawers on the starboard side. There is a good amount of room in there too and its in the path of the rigging tubes. Ya thats the other place I was thinking I've been in there once before feeding wires. Things are warming up this week. Gotta get out there with a power screwdriver. I went with the SmartPump in case I change cylinder(s) during a repower somewhere down the line. And, according to Garmin's marketing ...it will be more responsive at slow speeds and quieter. or just cut the existing hoses, put compression fittings on both ends and connect it to the pump and be done. I will have to break into one of the hoses near the helm for the Shadow valve. crimped fittings would make me feel better. Definitely going in this void behind the tackle drawer.